PTO Tractor Driven Centrifugal Irrigation Pumps - Every farmer should have one! DuCaR PTO Pumps are an excellent choice for COST effective and high performance sprinkler irrigation. These pumps are quick and easy to setup to begin irrigating in minutes! If you have a tractor that you want to utilize as the power source, PTO Pumps are a great choice and are capable up to 195 m3/h water output with high pressure performance up to 81 m head. These pumps are completely cast iron construction. It comes complete with suction hose assembly, stand and FREE shaft. The DuCaR DKT 125 Pump is a great match for a tractor up to 65 HP and running 2 of our model DuCaR Jet 50 Sprinkler with 50m shooting range or 1 of our large DuCaR Jet 70 Sprinkler with 70m shooting range. This pump will provide flow rates from 40 to 195 m3/h and pressures as high as 120 psi! DKT 50 2900 30 10 - 45 50 - 90 50 mm - 2" 65 mm - 2 ½"
DKT 80 2900 50 20 - 135 40 - 89 100 mm - 4" 100 mm - 4"
DKT 125 2900 50 40 - 195 40 - 82 125 mm - 5" 125 mm - 5"
IrrigationBox proudly presents Rovatti single & multi stage centrifugal pumps with overgear driven by cardan shaft of PTO. Designed for clean, waste water, slurry, sewage with solids and fibres, grey waters, recycled and active sludges. 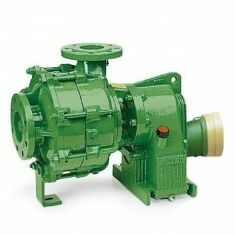 Rovatti T and TK series of horizontal centrifugal CELAN WATER pumps are fitted with an over gear transmission box to be driven from a tractor or similar with a PTO outlet via the use of a cardan shaft. Also available with a 3 point linkage or on a 2 wheeled trolley. 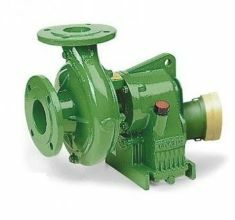 These pumps are highly suited for irrigation and washdown systems. A large range of single and multistage pumps to choose from with flows up to 90 m3/h and heads up to 127 m.
In addition to clean water pumps, Rovatti provides TL and TLK series of horizontal single-stage tractor PTO drive SLURRY pumps with heads up to 130 m and flows to 63 m3/h. 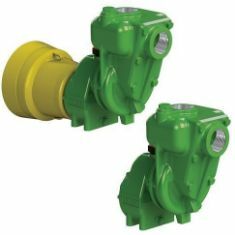 These pumps can be fitted with special pre-inlet choppers to reduce the intake load to a slurry. 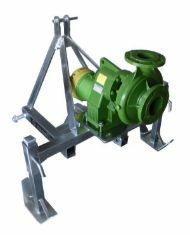 Also we have a variety of 3 point linkage frames available to carry these pumps. Every farmer should have one DuCaR PTO driven irrigation pump. 80 m³/h @80 m head. 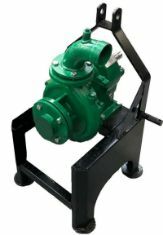 Long lasting, reliable, efficient PTO pump set. Every farmer should have one DuCaR PTO driven irrigation pump. 125 m³/h @75 m head. Long lasting, reliable, efficient PTO pump set.